Telling jokes to an audience is difficult (even top comedians get very nervous), telling lots of jokes is even harder. But how about telling a record amount in only an hour! The current world record stands at 549 gags in only 60 minutes. That is held by Australian Anthony Lehmann. The record was originally held by our very own “one-line king” Tim Vine who actually did it all by memory, which is very impressive. However Tim’s record only lasted 7 months before the Aussie came along and beat him. That was back in 2005. Now here we are 9 years later and hopefully the world record can come back to our shores. Donald Macleod, from Scotland, who is Head of Actuarial at Scottish Friendly Assurance Society is making the attempt. And far from just using other peoples gags, all the jokes he tells will be his own original ones. Donald will make the attempt on Wednesday 5th March in Park Bar, Glasgow (post code is ‘G3 8TE’ if you want to throw it in to Google Maps to see where it is). You can read more details about it on the Scottish Friendly website. There is also a cool competition going on where you can win a £100 TicketMaster voucher by uploading your best gag to Vine and then tweeting it to @scotfriendly. If you fancy yourself as a funny fellow get involved! Proceeds from the event will also go to charity which is great to see. They are being split between 4 charities in the Western Isles which is were Donald is originally from. The JustGiving page can be seen here which already has some great donations. 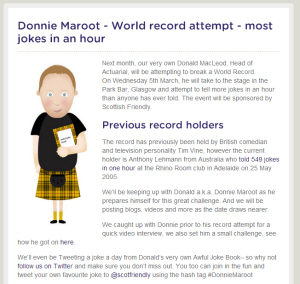 Good luck to Donald, let’s hope he can be beat the record!